Since the company’s foundation in 1960, Brückner Maschinenbau’s strategy has included to be at the forefront of technological development. 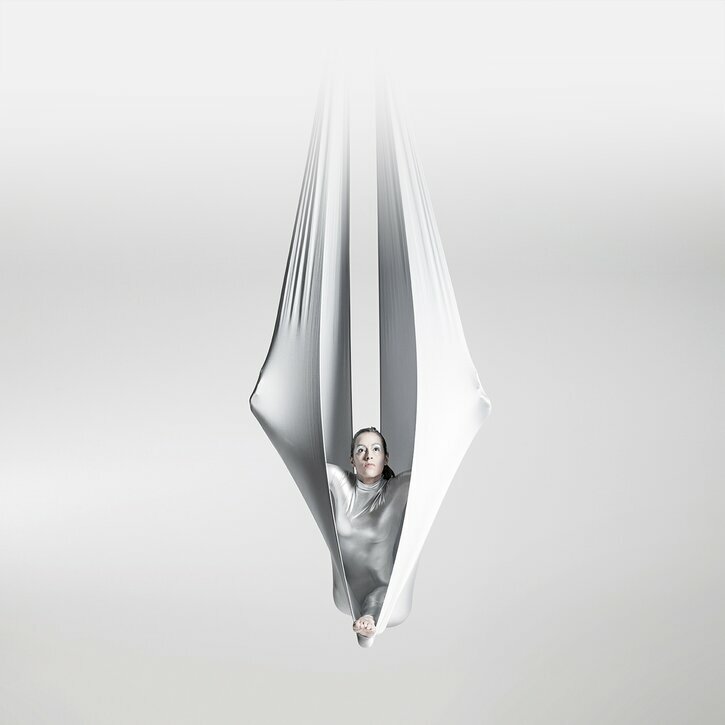 Brückner’s premises have always been home to technology centers, laboratories, pilot and lab lines as well as the industry’s leading experts for film stretching lines. “Home of film stretching technologies” is therefore no buzzword but a lived tradition. In Industry 4.0, production and state-of-the-art information and communication technology interlock. The driving force behind this development is the rapidly increasing digitisation of the economy and society. Production and logistics processes between companies in the same production process are intelligently linked to make production even more efficient and flexible. Overall, the profitability of production can be increased, the competitiveness of industry strengthened and the flexibility of production raised. What does that mean specifically for Brückner Maschinenbau? In many places in the company, digitalisation is being worked on. This influences our daily work as well as the further development of our products. SAP for order processing, CRM for customer management, engineering base in the cooperation between mechanics and electrics or EDI for the electronic order processing between us and suppliers are just a few internal tools with which we try to get complex contexts under control. Easy Operation (EOP), Decentralised Electrical Engineering / Intelligence, Machine Condition Monitoring (MCM) and the increasing number of assistance systems for plant control can be cited as examples of our lines. Line technology and customer requirements: decentralised intelligence (permit and ensure acceptance with dry running in pre-assembly). Continuous customer support via digital service platform with various modules such as remote platform, spare parts catalog and a service app. There is no way around digitisation. For the application to our own processes we pursue the strategy of the "fastest follower". With regard to our plant technology, we claim to be a trendsetter and to be ahead of our competitors. So we also consciously break new ground where necessary. "Coming together is the beginning. Keeping together is progress. Working together is success." We can relate to this quote from Henry Ford. We cooperate with various organisations, associations, universities and other partners worldwide. These partnerships are always based on give and take. Many of them have existed for many years now and form the basis for excellent cooperation. 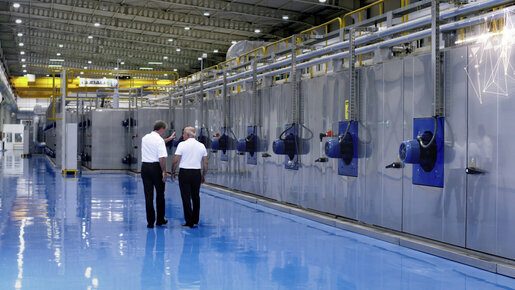 One of our long-standing cooperations is, for example, with the VDMA (German Engineering Federation). With about 3,200 members, the association is the largest network organization and an important mouthpiece of mechanical engineering in Germany and Europe. Under the umbrella of the VDMA, there are also various organizations with which we also work together. One of these is OE-A (Organic and Printed Electronics Association). The OE-A represents the entire value chain. More than 230 companies from Europe, Asia, North and South America and Oceania work together to help build a competitive production infrastructure for organic and printed electronics. We also work with more than 20 universities in Germany and five more in Europe, two in the US and two in China. In addition, we frequently cooperate with Fraunhofer Institutes and participate in various support projects. CEFLEX: Brückner Maschinenbau has been a member of CEFLEX (Circular Economy Flexible Packaging) since 2017. It is a joint project of various European companies and associations that represents the entire value chain of flexible packaging. DIN: As a partner of business, research and society, the German Institute for Standardization e.V. contributes significantly to developing innovations to market maturity and opening up future fields such as Industry 4.0 and Smart Cities. Around 33,500 experts from industry and research contribute their expertise - including experts from Brückner Maschinenbau. EUROMAP: Since 1964, EUROMAP has been the umbrella organization of the European plastics and rubber machinery industry, accounting for about 40% of world production and 50% export volume. fortiss: fortiss is the research institute of the Free State of Bavaria for software-intensive systems and services. In particular, basic and application-oriented research is being conducted in the areas of software and systems engineering, cyber-physical systems and information systems as well as in the fields of information security, broadband infrastructure and network policy, e-government and digital innovations. Mittelstand 4.0: The initiative "Mittelstand 4.0 - Digital Production and Work Processes" supports small and medium-sized enterprises and skilled trades in digitization, networking and implementation of Industry 4.0 applications. The companies are assisted by a total of 23 Mittelstand 4.0 competence centers throughout Germany. Brückner’s “Easy Operation” is a completely new, integrated solution, focusing on the process view as opposed to the usual machine view. At the same time the new operating concept offers guided operation by usage of assistants ensuring constant high efficiency and quality in film production. 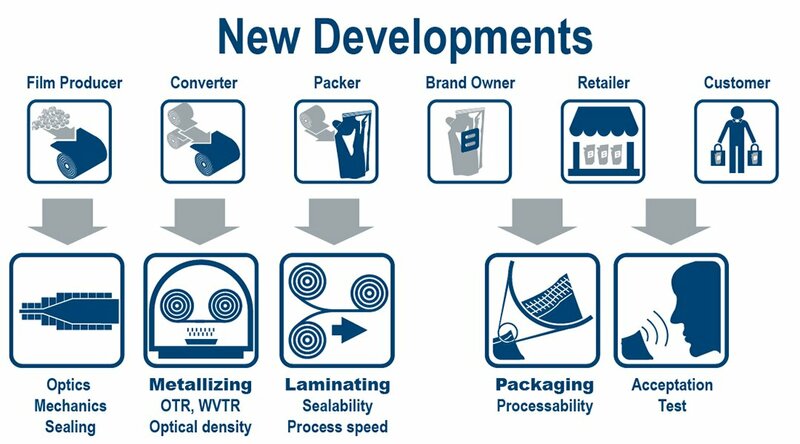 Continually increasing speed and output with ever shorter delivery times and production lots, but at the same time satisfying a growing demand for quality and product variety make running a film stretching line a highly complex business. Film producers and their operating personnel stand before increasing challenges when it comes to guaranteeing a stable and efficient production with the highest quality film. Brückner recognized this development at an early stage and created a new concept for operating stretching lines called – Easy Operation (EOP). The traditional means of control and still the standard today is the so-called machine control. The machine visualisation, used as front-end, represents details of sensors and actors. User interaction requires high skills and knowledge. For example, film temperature control is done indirectly, acting on air temperature and fan speed. Following the process control approach, the user will directly set the film temperature. The related machine parameter settings of air temperature and fan speed are calculated by a smart algorithm (patent pending). The efficiency of the production process and the obtained film quality depends on various factors, e.g. operator skills, shift, weekday. For critical, often performed activities, so-called assistants are in development. The assistant will guide the operator by means of predefined, customisable operating steps. The operating steps may follow, for example, the company standard procedure. Using an assistant the operator still maintains full control of the process. If required he may interfere manually at any time. The advantage is clear: constant high efficiency and quality. 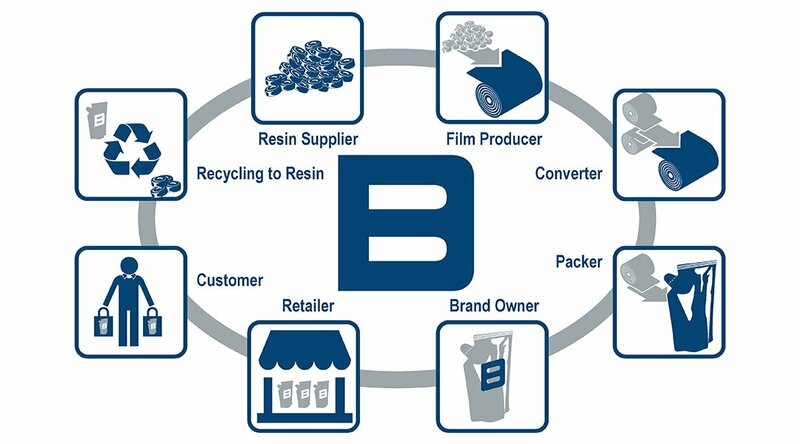 Within the area of (plastics) packaging the classic supply chain comprises resin suppliers, film producers, converters, packers, brand owners, retailers and finally the customer or end user. If this is complemented by the machine suppliers who interact with several chain members, we can speak about an integrated supply chain – or to be even more precise – about a value and innovation chain. And today the inclusion of recycling issues is another useful step. 2002 | Start-up of 18 stretching lines: 40% of them according to the agreed time schedule, 60% explicitly earlier. None late! 1991 | Programme acquisition from Kampf Maschinenfabrik GmbH & Co.
1989 | Product programme acquisition from Proctor & Schwartz Ltd.